As a neuroscience major, it’s ingrained in me to sort through data, analyze trends, and compile summaries…Though its been over a year since graduation, I continue to examine everything from science to fashion with equal diligence, curiosity, and passion. When reflecting on popular it bags this past year, I’ve noticed, Phoebe Philo, has done it again! A key player in today’s fashion scene, Philo, Celine’s present creative director, continues to influence and transform the fashion world with her cutting edge designs. Some highlights from her fashion journey include designing Chloe’s Paddington, one of the most popular it bags of all time, and now, Celine’s Luggage Tote~ the bag everyone seems to be toting around. Her innovative ideas revived Celine, and pushed the brand to the forefronts of fashion. This time around, a sharp, edgy, winged look seems to be her magic formula for success. Picking up on this trend, designers from Valentino, Phillip Lim, Jill Sander, Alexander Wang, BCBG, and many more also begin incorporating a subtle winged look to their everyday bags. You don’t always have to spend $2,000+ on a handbag to keep up with the latest fashion trends. Why not give these other bags a try? Thank You Teodora! :) Great picks, two of my favorites! 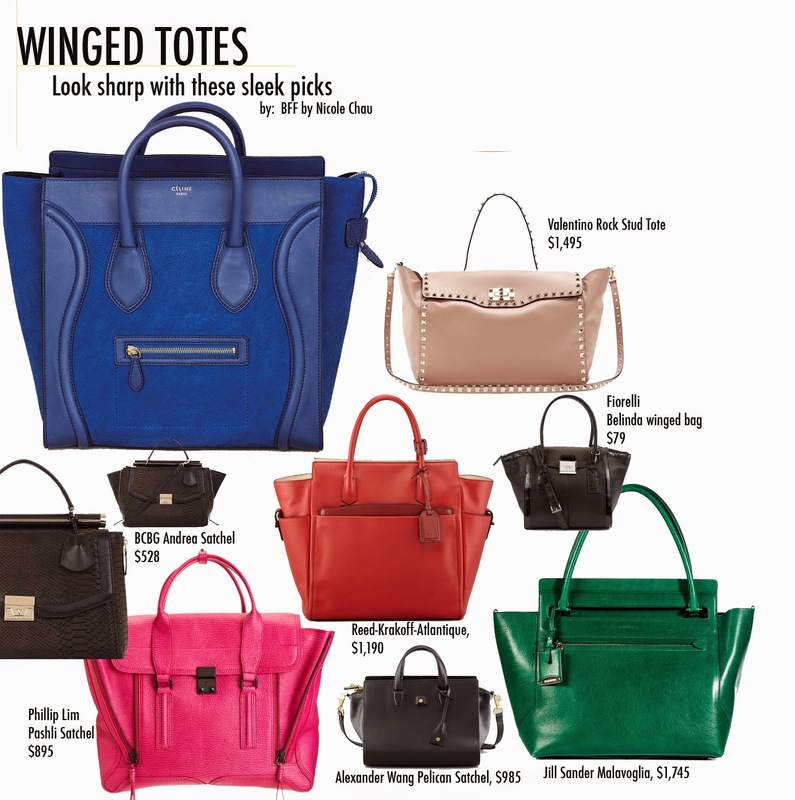 Winged totes and bags with bows are soooo aweeesssome!